Recently (or over the past year) the internet has been digging up rumours upon rumours that the next Xbox will be ‘always online’. Of course nothing will be confirmed until the conference in late May, but let’s talk about the most persistent (and honestly, the most likely) one. Here we have exhibit A: a (now dismissed) Microsoft employee insists that an always online next generation Xbox would be hassle free and cause no drama. After this exceptionally strong dramatic incident, the question on everybody’s mind is would an always online connection work? 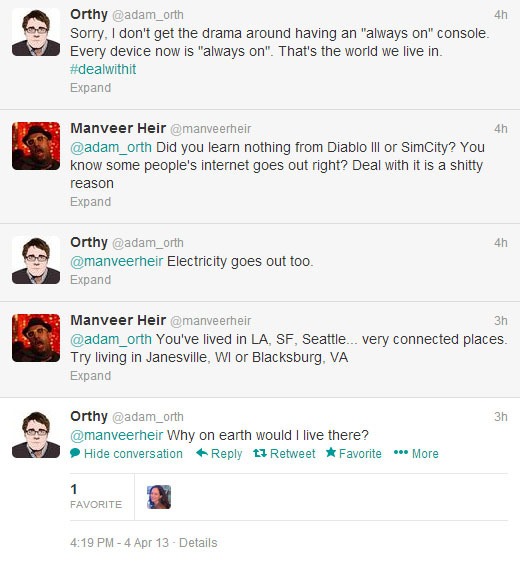 Obviously in the very, VERY specific places that Adam Orth mentions, sure, having an permanently connected Xbox would be fine. But let me tell you about Australia. Hi, I live in Melbourne, in a well populated suburb not too far from the city. My internet is terrible. Connections drop out every half hour, speeds slow down to a crawl, and we currently are on a plan with a 50gb cap, 70 offpeak. That’s not much at all. And while it’s far from the best plan Australia has to offer, it is an average one. And while my Xbox remains connected to the internet MOST of the time (occasionally dropping out or foregoing a connection entirely when I run over my plan), there is absolutely no guarantee that in the immediate future, I would be prepared to handle an always online connection. And this is Australia. Thousands of people are in the exact same conditions as I am, for better or worse. Australia have just announced a National Broadband Network that will seek to fix some of these slow speed and low download/upload problems, yet this plan is a LONG term plan, and one that is between a rock and a hard place, as one political party seeks to make it high tech and fast at an incredibly expensive rate and longer production time, and another party suggesting a PAINFULLY outdated and ultimately slower plan that would come out sooner and cheaper. America isn’t the only place buying and using the Xbox system, Orth. And even in North America, there have been absolutely no indications that Microsoft are ready for an always online console. SimCity and Diablo 3, just two recent examples of ‘always online’ crashing spectacularly and failing. In no way were servers prepared for launch, and while things have improved over time, it’s clear that a launch day Xbox, if proposed to use an always online console, will be nothing but failure. I have absolutely no faith that we are prepared for this kind of launch. This isn’t a anti-Xbox rant, or a fanboy defending other consoles, this is reality. I know that consumers wouldn’t want this. Why is Microsoft even suggesting the idea? Their outright silence on this matter is more concerning than comforting. At this point, we can only wait until the press conference in a few weeks. Sure, this plan would probably reduce piracy. But who’s pirating your games when there’s nobody playing them?